The introductory theme of the Variations op. 41 takes the form of a jazzed-up rendition of the opening solo bassoon motif from Stravinsky's The Rite of Spring, and the whole set of variations encompasses Kapustin's style in microcosm. Every conceivable mainstream jazz influence is to be found in this work, evoking memories of Count Basie and Erroll Garner amongst others, while all the time subjecting itself to traditional classical form. In particular, the last four pages contain some of Kapustin's most exciting music. 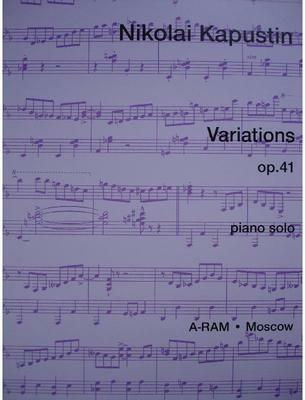 What do you want to know about Variations op 41 by Nikolai Kapustin?